This event allows the Bourgogne Wine Board (BIVB) to select the wines that will be representing the region over the next 12 months, through the BIVB’s promotional and training activities in France and around the world. This year, the President of the BIVB hailed the ever-increasing quality of the selection. An edition with stiff competition! In 2018, of the 1,138 samples submitted, 218 cuvées were selected (68% from estates, 9% from cellars, and 23% from négociants). The 2016 vintage was the most popular, accounting for 133 wines out of 218. This illustrates the clear potential of this vintage which, despite low yields due to the unreliable weather in the spring of 2016 with frost and hail, is clearly a great one in terms of quality. The BIVB buys all the wines selected for the Cave de Prestige. In 2018, almost 14,500 bottles were purchased by the BIVB. You can discover these wines which are offered for tasting at events organized by the BIVB throughout the year by clicking here. Click here to download the list of wines to be included in the Cave de Prestige 2018. How well do you know the appellation? Bourgogne sparkling wine entered history in 1830 through the pen of Alfred de Musset, who celebrated it in “Secrètes pensées de Raphaël”. By the beginning of the 19th century, sparkling wines was already produced in Chablis, Nuits-Saint-Georges, Rully, and Tonnerre. The Crémant de Bourgogne appellation was granted in 1975 for wines produced according to strict production specifications encompassing traditional expertise and high-quality vinification. 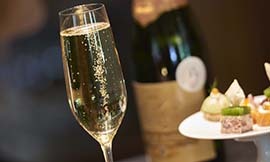 Crémant de Bourgogne can be white or rosé; blanc de blancs, or blanc de noirs; brut, extra brut, and less frequently, demi-sec. It can be produced across the entire Bourgogne area. Click here for the information sheet about Crémant de Bourgogne. Click here for a list of producers of Crémant de Bourgogne. All the latest information about the third and fourth biggest markets for Bourgogne wines in terms of revenue. In 2017, Canada remained the fourth biggest export market for Bourgogne wines in terms of revenue, behind the USA, UK, and Japan, but ahead of Belgium, with 6%. Some 6.5 million bottles of Bourgogne wine (up 6.9% on 2016) were shipped there, for 49.8 million euros (up 8.9% on 2016). This was predominantly white wine, accounting for 64% of total exports (up), ahead of reds with 31% (down), and Crémant de Bourgogne which accounted for 5% (up). The majority of sales were in Quebec, ahead of Ontario. Click here for the full Canada market report. Japan was the third biggest export market for Bourgogne wines by both volume and revenue, against a backdrop of stability for imports of French AOC wines (up 1.4% on 2016). In 2017, 7.6 million bottles of Bourgogne wine were shipped (down 3.3% on 2016), for revenue of 103.5 million euros (up 5.8% on 2016). This was mainly white (55%), although the proportion was down due to the lack of available stocks. Red wines were stable at 40%, whereas Crémant de Bourgogne sales continued to grow (5%). Click here for the full Japan market report. For the second time, Chablis wines are represented at this event, which takes place in Niagara, Canada, from 20-22 July. To kick things off, on Friday 20 July, lunch is sponsored by Chablis wines. 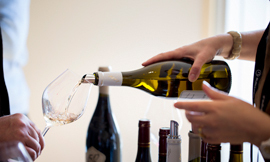 Then from 3:45pm to 4:45pm, a seminar entitled “From Petit Chablis to Chablis Grand Cru” will run at White Oaks Resort, which will enlighten participants on what makes Chablis wines so unique. Chablis wines will also have a dedicated space for trade tastings. Christian Moreau from the Domaine Christian Moreau Père et Fils will be present to answer all your questions. 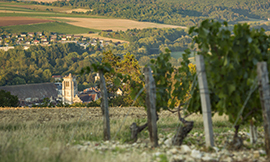 There are many reasons why Chablis wines are unique among Chardonnay wines produced around the world. Firstly, the geology, and more precisely, the Kimmeridgian soil and its tiny fossilized oysters give such a distinctive mineral expression to Chablis wines. Secondly, the region’s northern location and, as a consequence, its cool climate, provide the best environment for Chardonnay grapes to develop such a pure, elegant and terroir-focused white wine, always striking a perfect balance between crispness and fruity expression. In Chablis, the Chardonnay grape can reach its full potential as a varietal that conveys terroir, highlighting the distinctive features of each of the Chablis appellations – Petit Chablis, Chablis and Chablis Premier Cru, Chablis Grand Cru – and the various Climats contained within them. Head to Washington DC on 23 July for a tasting conference on “Everything you never dared to ask about the Climats of Bourgogne”. Are you a sommelier or Master Sommelier? Then book your place at this unique seminar on 23 July 2018 between 2:00pm and 3:30pm at The Westin Georgetown. Jay Youmans, MW, and Official Bourgogne Wines Ambassador, will be hosting the event which will include a tasting of eight wines from eight different Climats. Trade only – Medium to advanced wine knowledge required. Year-round, your clients no doubt have plenty of questions about the world of winegrowers and their environment. What is happening right now in the vines? What is each stage in the winegrowing process actually for? The Bourgogne Wine Board (BIVB) and steering committee of the “Terroir and Territory: A Commitment for the Future” regional charter have come together to answer these questions through a handy and simple booklet called, “The World of the Winegrower”. It aims to reveal the daily work of the thousands of men and women who work in the vines of Bourgogne. These vines, like all beautiful things, require a great deal of care and attention throughout the year. The booklet also reveals how winegrowers in Bourgogne are responding to society’s serious concerns about environmental protection. Click here to download the booklet from the BIVB website (from July). An in-depth and ergonomic website to meet the needs of all trainers, wherever they are. 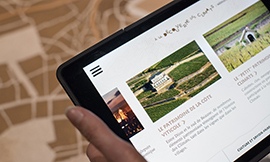 The Bourgogne Wine Board (BIVB) has created this site to allow trainers, wherever they are, to easily prepare for training sessions on Bourgogne wines. Structured according to your needs, it includes plenty of educational resources (training materials, videos, maps, brochures, etc. ), along with all the latest news from the vineyards and our latest press releases. 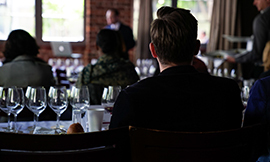 Whether you are a trainer in an international institution such as WSET, WSG, or SWE; or a teacher in a hotel school this is the place for you. 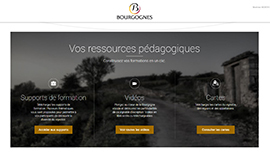 Take a look at the Educators’ section of the Bourgogne wines website, or click here to create an account. Summer’s off to a good start with a free app! The Maison des Climats du Vignoble de Bourgogne is an exhibition that explains the history of the Climats and their inclusion on the UNESCO World Heritage List. Also new is something to please any more “remote” lovers of Bourgogne wines – your clients, or perhaps you yourself. All the content of the Maison des Climats’ digital library is now freely accessible on IOS or Android devices. “A la Découverte des Climats de Bourgogne” is available in both French and English, and comprises more than 40 articles, some 150 photos, and a wealth of archive documents to understand the Climats, the wines, appellations, and heritage of Bourgogne. Click here to download it on the App store or on the Play store. To help your clients prepare their trips to the Bourgogne winegrowing region, there are now two labels to guide you. This charter, which represents conviviality, was developed by the Bourgogne Wine Board (BIVB), and brings together 364 wine-industry professionals, including winegrower, cooperative cellars, and négociants-éleveurs. In signing up to the charter, they have committed to turning a simple visit into a warm and enriching experience. This label was created in 2009 and rewards the networking efforts of all those in the wine-related tourism sector – including accommodation providers, restaurants, cellars, cultural and heritage sites, leisure activity providers, natural spaces, and event organizers – in a specific area, and their determination to add value to their wine-related tourism offer. The aim is to improve how tourists are welcomed to the region and to ensure their experiences are rich and unforgettable. The label brings together all cellars with the regional De Vignes en Caves label in the area specified, and now covers almost the entire region. Indeed, the Tonnerrois region has just become the eighth destination to be awarded the recognition. This destination, with some 41 tourism services, including nine wine cellars, is definitely one to recommend to your clients! Click here for more information about the Tonnerrois region (in french only). Click here for more information about the "Vignobles & Découvertes" label (in french only). “Rencontres avec les Bourgognes”, your fall rendezvous. Tastings hosted by Bourgogne professionals at your point of sale. VinoVision and Vinisud will run conjointly in Paris. Chablis wines will be participating in the International Cool Climate Chardonnay Celebration, with a masterclass and professional tasting. Press workshop around Bourgogne wines and their Climats. A masterclass on “Everything you’ve never dared to ask about the Climats de Bourgogne”, hosted by Jay Youmans at the SOMMCON conference. A visit from four influential American sommeliers to the region from 16-20 July for a full immersion in the vineyard.